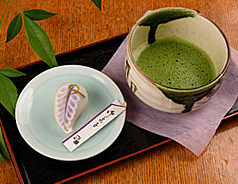 In Tsuruse’s comfortable tearoom, guests can sample any of the delicious specialities on display in the showcase. 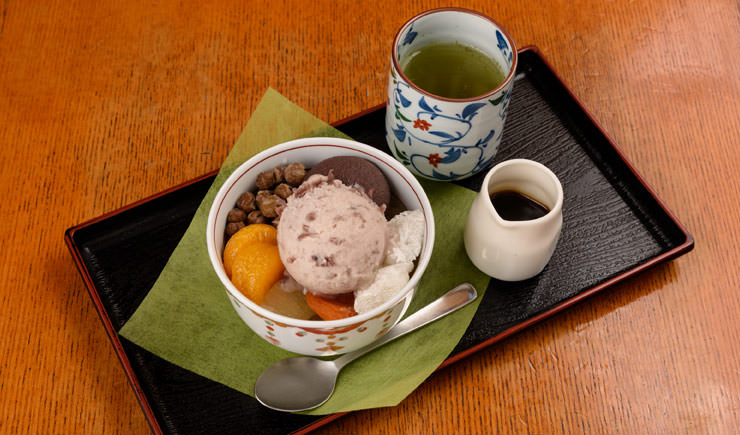 Relax and enjoy our unique flavours. 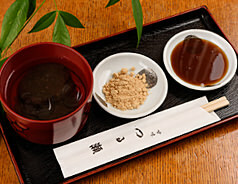 Tokoroten is made from kanten, a jelly extracted from seaweed mixed with bonito fish stock, soy sauce and two types of vinegar to give it a fresh and supple texture. 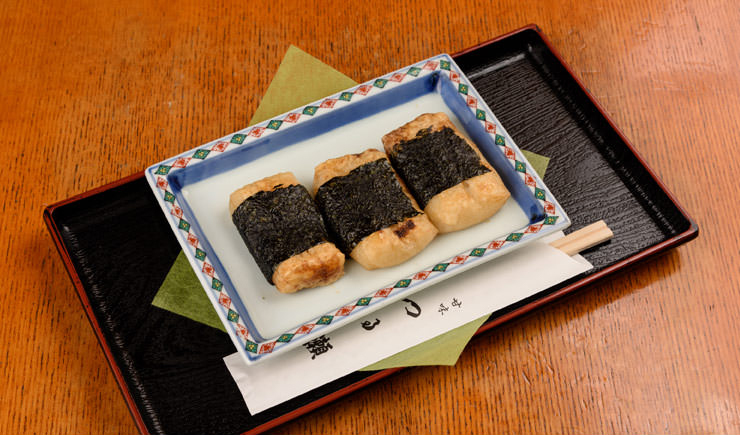 Delicious with toasted golden sesame seeds. 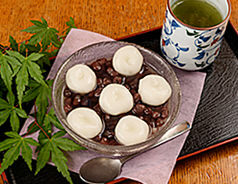 This home-made sweet red bean soup contains pearl-like chewy rice dumplings. 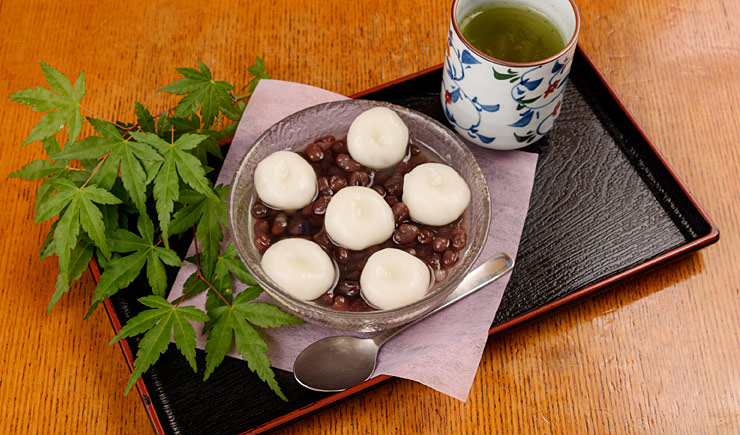 Skewered dumplings made from the mugwort herb with mashed adzuki bean paste, and roasted dumplings steeped in kelp stock based on sweet soy sauce. 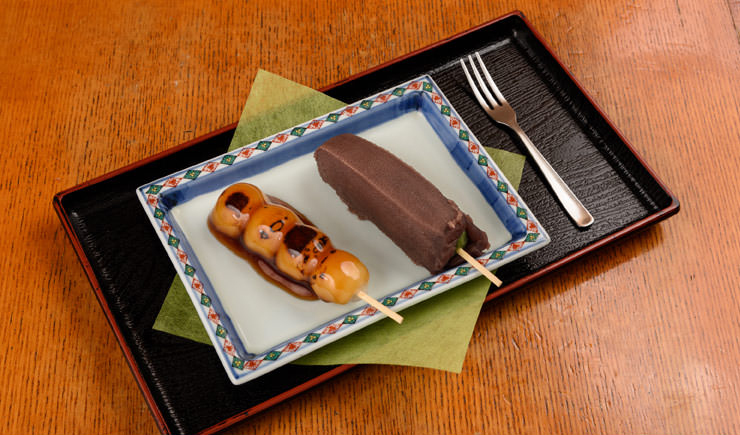 Both types are deliciously satisfying. 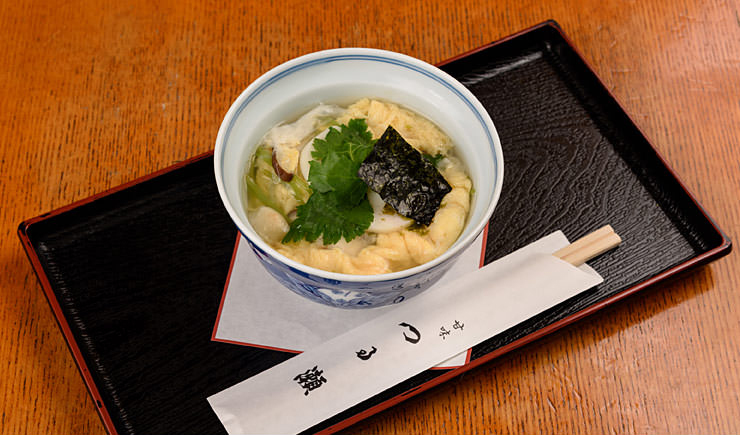 This savoury soup is seasoned with kelp and dried bonito fish stock, blended with rice cake, shiitake mushrooms, bamboo shoots and egg. 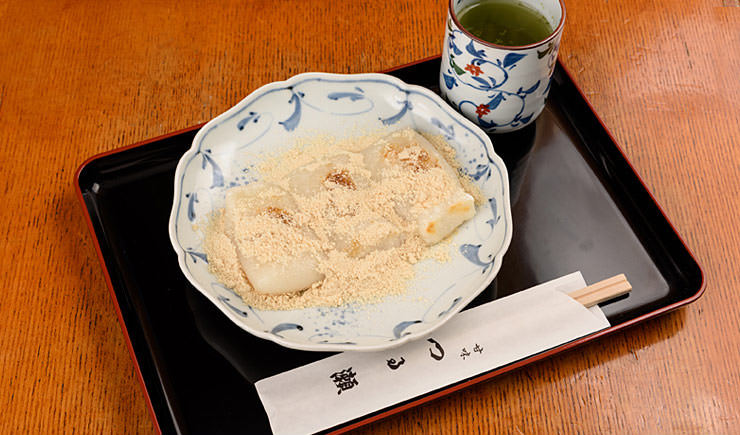 This freshly pounded rice cake is coated with Hokkaido soya bean flour mixed with sugar and salt. 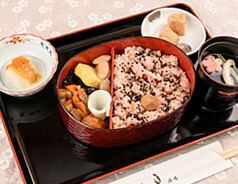 This is a set menu comprising steamed rice with red beans, homemade kinpira, (chopped burdock root cooked in soy sauce and sesame oil), satsumaage, (fried fish cake), and rolled omelette. 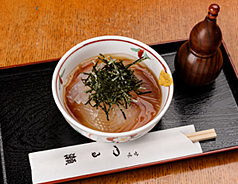 It is served with soup and dessert, (warabimochi, a local delicacy made from bracken starch). 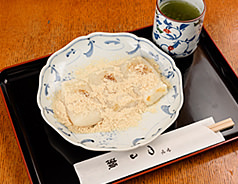 This freshly pounded rice cake is seasoned in the traditional way with soy sauce and seaweed. 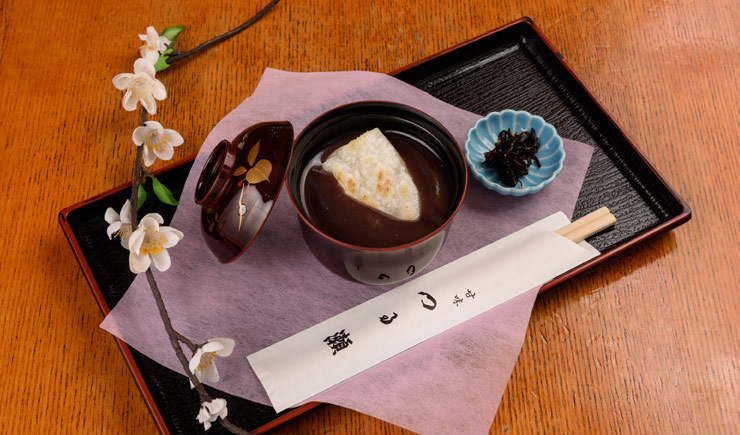 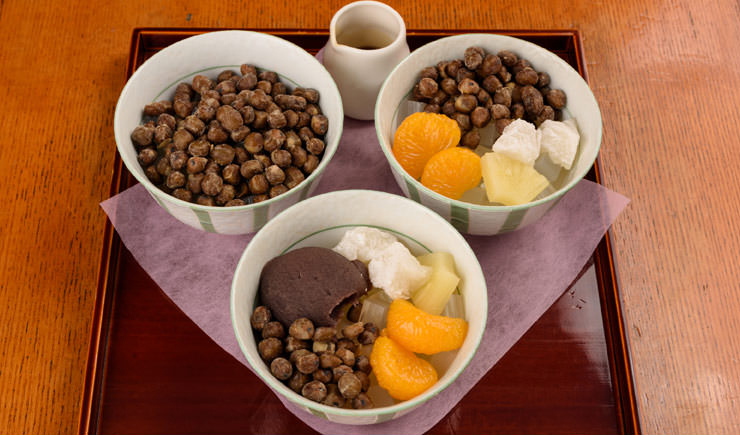 Anmitsu consists of small cubes of agar jelly with azuki bean paste, boiled red peas, rice flour gyuhi and fruits, served with brown sugar syrup. 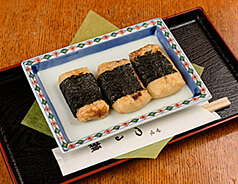 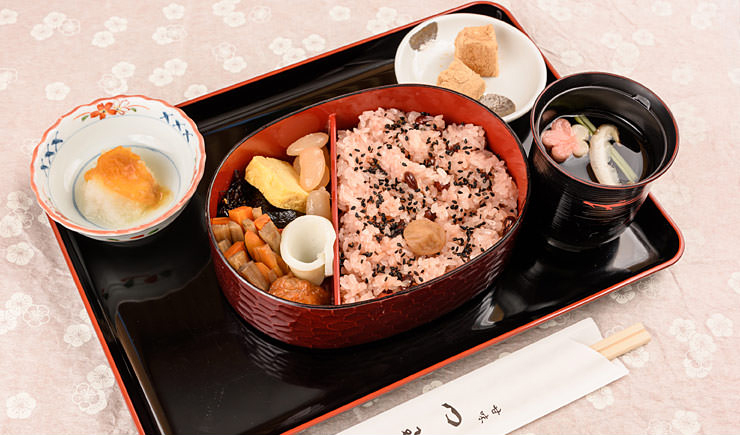 Mitsumame is Anmitu without azuki bean paste. 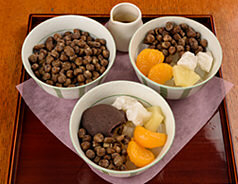 Mamekan contains only boiled red peas with a pleasant soft and salty texture. 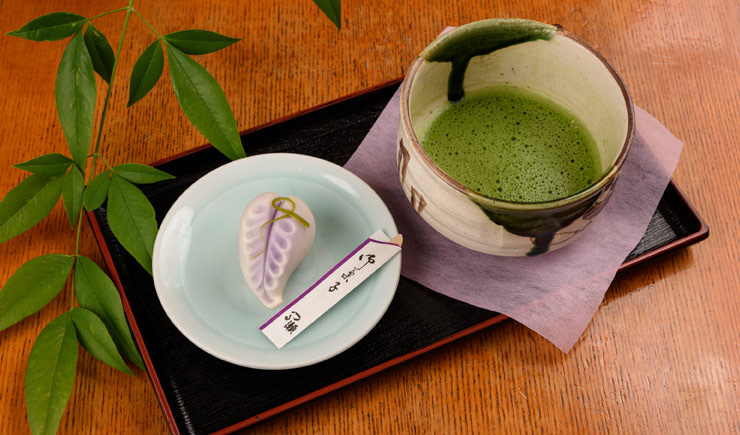 Enjoy green tea with jyonamagashi, (fresh wagashi, a traditional Japanese confection). 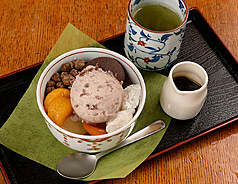 There are six types to choose from. 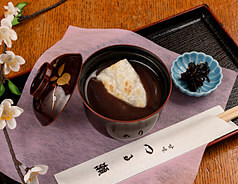 This is Anmitsu with a scoop of homemade azuki ice cream which comes with slightly bitter Okinawa brown sugar syrup. 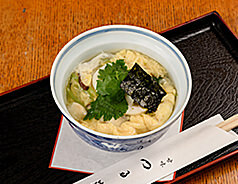 This homemade sweet adzuki soup comes with freshly pounded rice cake. 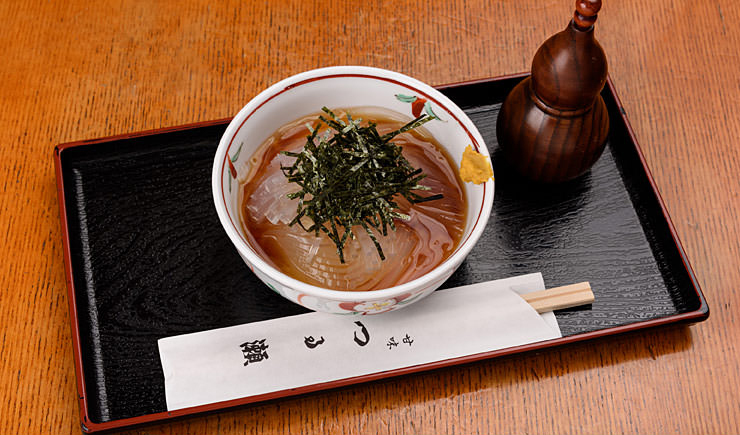 This popular favourite is made of genuine Warabi (bracken starch). 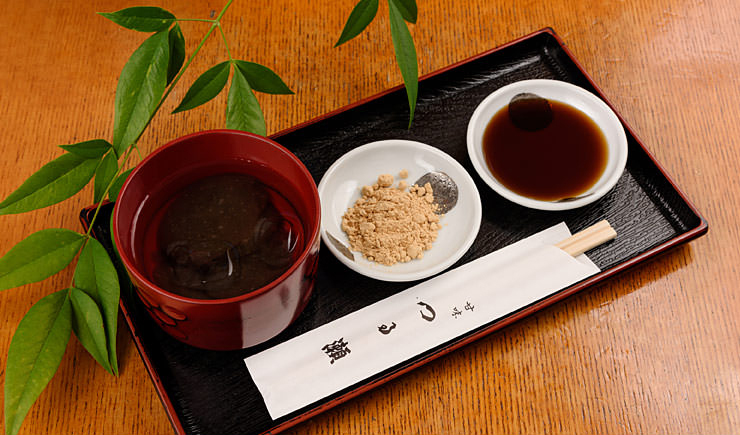 Enjoy its pleasant effect on the tongue and throat! 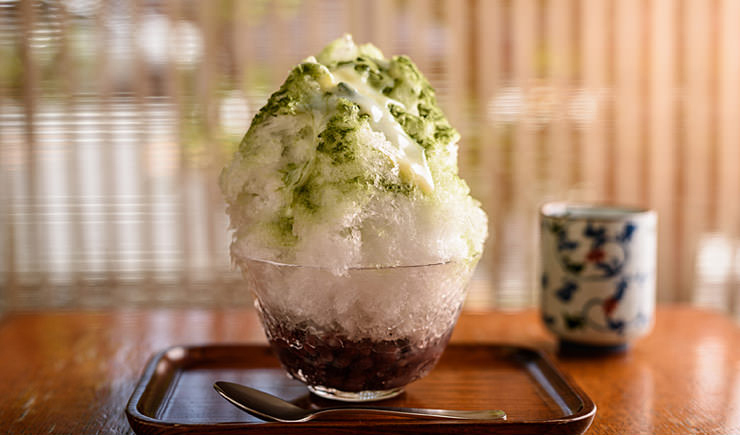 This is shaved ice flavored with powdered Uji green tea and topped with special sweet red beans and homemade syrup. 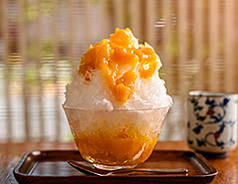 The true flavour of summer. 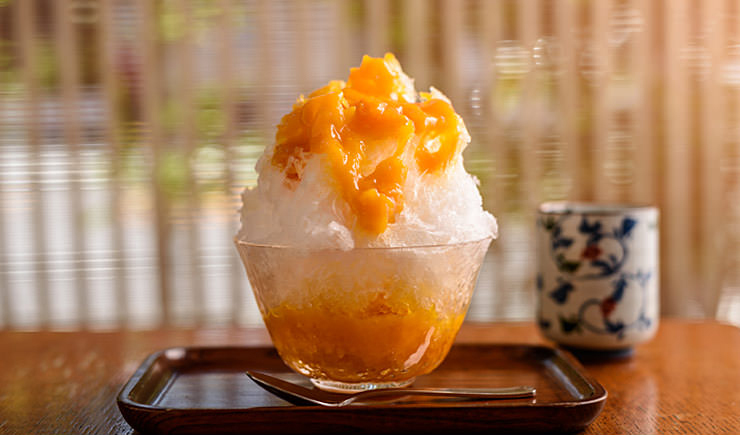 Created in 2014, this refreshing dessert features shaved ice topped with mango puree and homemade syrup. 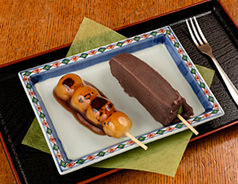 The perfect summer treat. 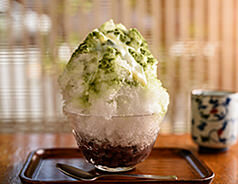 * Kori, (shaved ice), is available only in the summer season.